I'm not going to lie to you and tell you about all the authentic food we ate while in Mexico. Most of the time we ate on the ship. But unless Prune Tarts are a Hispanic delicacy I wouldn't put the food on the ship in any "authentic" food category. We did eat quesadillas on the beach in Manzanillo (which is named for the apple trees which no longer exist there because the Conquistadors cut them down to build ships to invade other places). They were quite tasty (the quesadillas, not the apple trees). We also ate something called a Fundador that was on the menu. Tess thought it was going to be nachos, but it turned out to be congealed cheese with slices of bacon floating in it. It was served with tortillas. It was also quite tasty. Oh we had fresh Ahi Ahi in Zihuatanejo. And some guy tried to sell us a just caught Red Snapper on the beach there. I declined since carrying around a dead fish in the hot sun isn't a good idea when you are traveling. I also declined an offer to buy pot and cocaine on the same beach for similar reasons. Okay, I admit it. We ate bar food at a Hard Rock Cafe in Acapulco. There. Are you satisfied? Give me a break. I collect their shot glasses. Let's face it. Life is too short not to be self-indulgent when you are on vacation. So I was. 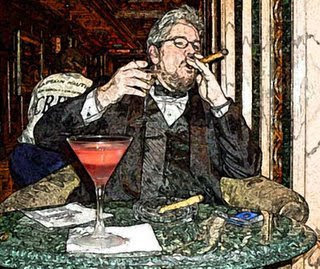 I smoked cigars. I drank martinis. I ate steak. 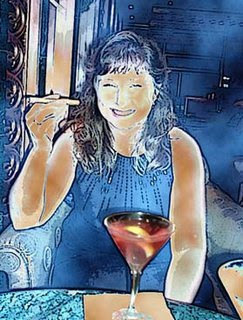 I even convinced my lovely wife to smoke a cigar. You know what? It was fun being self-indulgent. It was fun ignoring cholesterol and fat and the evils of alcohol consumption. I even got to like the taste of cigars (though not the morning after taste in my mouth that was very similar to having a bear use your mouth as an outhouse...not that this has ever happened to me...again). Anyway, that is about all I have to say about that. It was basically an excuse to put my face on a quesadilla. I bid 57......hey, where's the damn cent key.....what the hell?........why in the hell is there no cent key on this keyboard?!!!! This is outrageous! This is a personal afront! I call for keyboard design JIHAD! KILL THEM ALL!!!!!!!!! 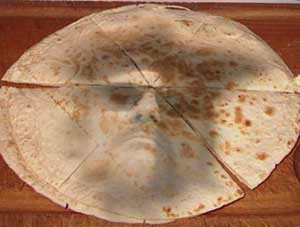 Oh, and another thing....isn't is blasphemous to display the likeness of TIM-ELVIS on a tortilla!?!?! JIHAD! KILL THEM ALL! Thanks Shandi. I did tell everyone at work that it was Freaky Friday. I'm thinking of calling the quesadilla the Tortilla of Turin. I love Photoshop. the michael, I can think of no more appropriate place to display the likeness of Tim-Elvis. Though I am working on a bobblehead and antenna ball.